Pink Thanksgiving Decor. It’s like regular Thanksgiving Decor but with a dash of one of my favorite colors, Pink! A traditional autumn palette of browns and oranges doesn’t do much for me but when you add a pretty pop of pink, I’m all over decorating for Fall. Here’s a collection of inspiring photos, projects, and recipes from a few of our favorite sites. 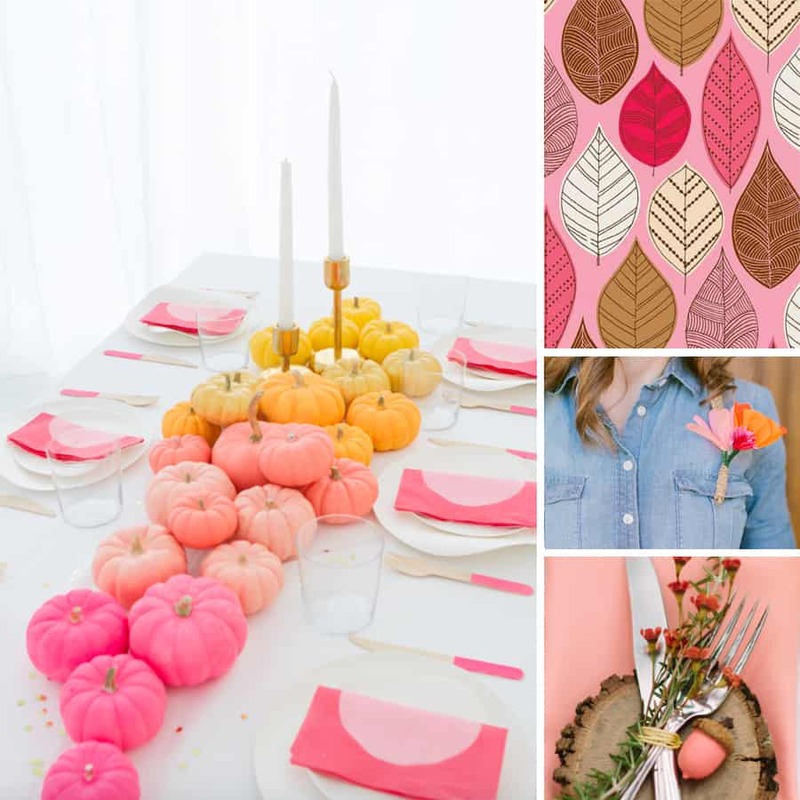 We hope that you are inspired to make everything a little prettier with a Pink Thanksgiving! This giclee print from Eloise Renouf can add a pop of autumn-inspired pink to your home. Autumn Leaves Pink is available for purchase, ready to frame, on Etsy. Learn How to Make a Crepe Paper Flower Corsage right her on Pretty Prudent. They make a gorgeous gift for your Thanksgiving Dinner guests and can double as table decor. I love how they look on this denim shirt. It’s the perfect Pink Thanksgiving combo. How cute is this pink acorn? Once you give the kiddos the job of painting acorns, add them to your place settings with other rustic fall elements like they did for this Autumn Sunset styled shoot; Photography by Loft Photographie, floral by Gypsy Floral and Events, featured on Green Wedding Shoes. 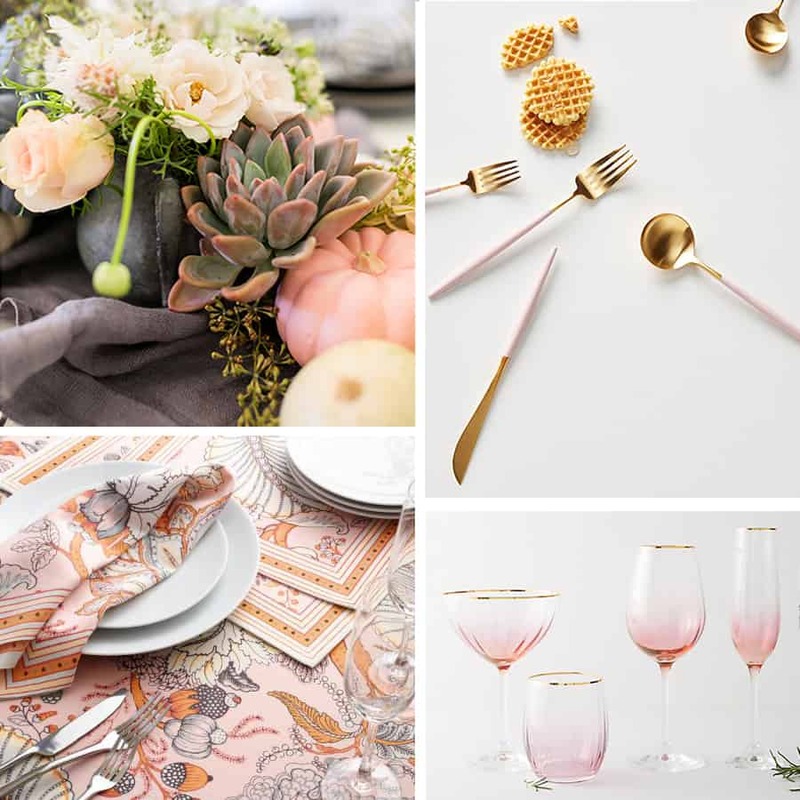 Now that every holiday can be “pink” it might be time to take the plunge on blush flatware. I adore this set of from Anthro, it’s simple modern style provides the perfect balance to its feminine color palette. How beautiful are these pink and orange floral table linens from World Market? And since you are all in on pink, don’t I have you convinced?, here are the perfect pink waterfall glasses to toast with your friends and family from Thanksgiving all the way through New Years. They are just stunning. 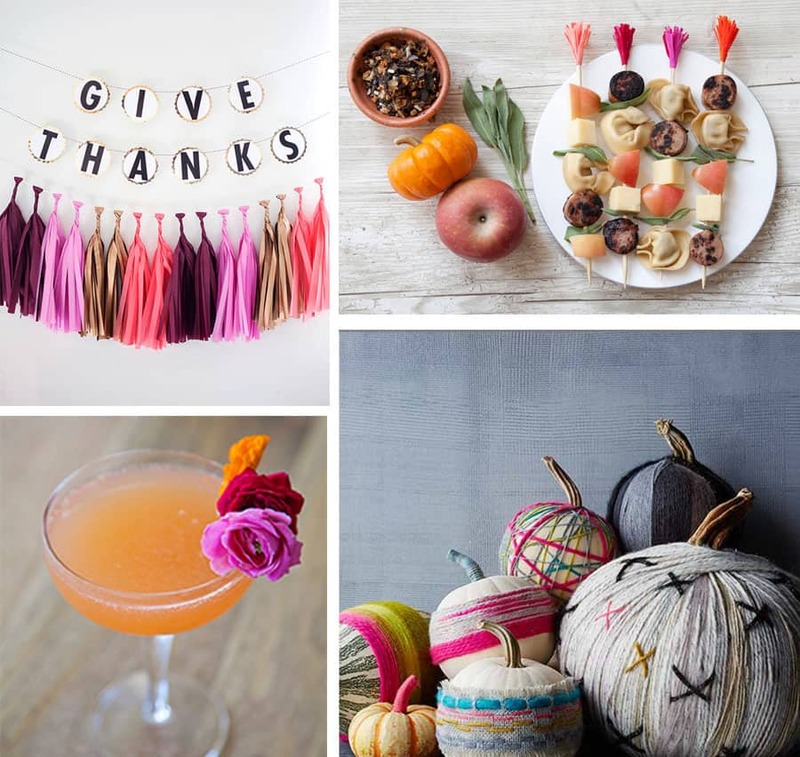 Learn how to make a DIY Gold Scallop Thanksgiving Banner with Homey Oh My! This Pink Thanksgiving Decor is perfect for the mantle or entryway. Our Sweet and Savory Pumpkin Spice Skewers make a great hearty Thanksgiving Appetizer. Add a bit of flair (and pink!) to the skewers with these easy frilly toothpicks. Create a festive cocktail and add blooms in shades of pink and orange like we did for this Sparkling Rum Punch, an unexpected tropical cocktail that works wonderfully when, eh hem, entertaining a large crowd. These yarn wrapped pumpkins from BHG are a scene of perfect autumn coziness. This is a project that could keep the kids busy for hours. Be sure to include some pink yarn, it really gives the decor a modern and fun twist. Read more about this project and more DIY autumn decor from BHG in this slideshow. Dinner is at 1 but come as soon as you are ready for a glass of Champagne.